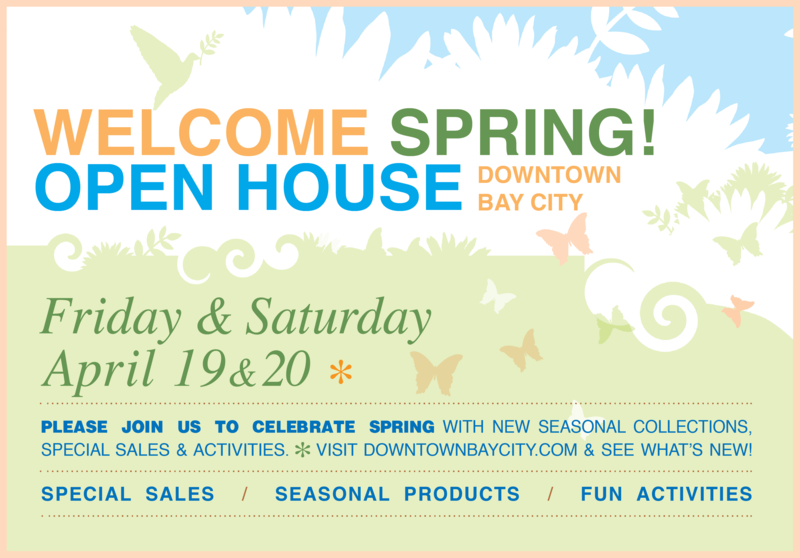 Downtown Welcomes Spring with Open Houses all over town. Enjoy the true signs of spring with beautiful new ideas and products for home, fashions to lift your spirits and a bounty of dining options. 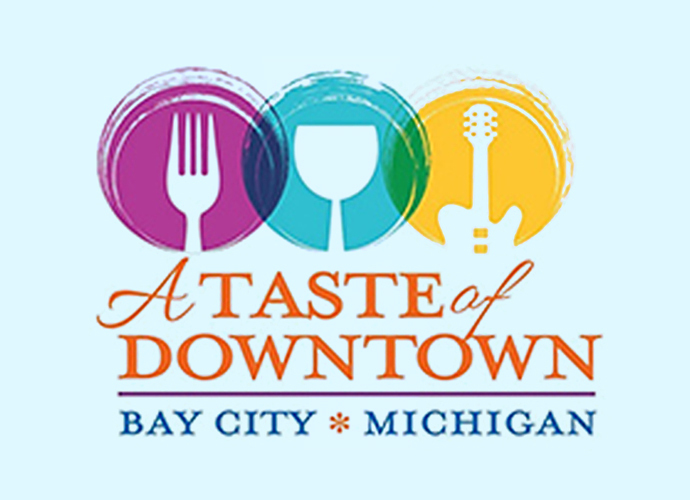 A great time of the year to get out of the house and stroll historic Downtown Bay City! 99 Trees Bookstore – 302 Center Ave. – Join us for an open house celebrating our American History with interactive educational fun for the whole family! A Wedding & Gift Boutique / Sweet Choices Cake Decorating School – 108 Fourth St. – Clearance of wedding & shower accessories 45% off! Clearance sales on select baking/cake decorating supplies. Bayshire Beauty Academy – 917 Saginaw St. Free pedicure with the purchase of a manicure! Beatles & Beans Coffee Emporium – 916 N Water St. – Spring into Beatles And Beans Coffee Emporium. Latte Fab Favorite specialty beverages. Experience the new Coffee Revolution, Bean-A-Mania! Let It Bean! Coyer Candle Co. – 112 Third St. – $2 off $10 purchase, $12 – 21 oz. Status candles, $3 Great Lakes Air Fresheners, Earth Day candles and clearance! Delta College Planetarium – 100 Center Ave. – Sit and relax in the dark cozy comfort of the Planetarium’s Dome360 Theatre and be treated to beautiful music with breathtaking views of space, mind-provoking immersive art and 360-surround environments. Saturday, April 20 at 12:30pm. Special price of only $3 a seat. Ferne Boutique – 922 Washington Ave. – Showcasing our Spring and Summer styles! G.T. Homestead – 109 Third St. – Our shop is filled with lots of new spring decor! In-store specials, refreshments, & receive an entry to win a G.T. Homestead gift certificate with any purchase! Herter Music Center – 901 Washington Ave. – Stock up on all your musical needs for spring with our Spring Clearance Sale. Herman Hiss & Company – 905 Washington Ave. – Come see new home décor and Spring fashions while you enjoy refreshments! 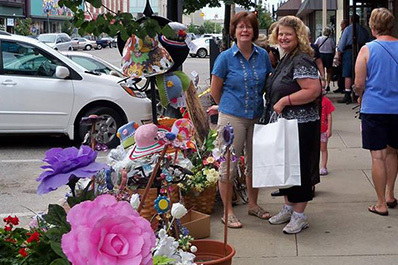 Litte House – 924 N Water St. – The store is filled with new decor and gifts just in time for Spring makeovers. Little Shop Boutique – 107 Fifth St. – Free treats from Barney’s Bakery (1 per customer) and a drawing to win a $25 gift card for Little Shop Boutique. MeadowCreek Clothiers – 920 Washington Ave. – Stop into MeadowCreek to see The Full Collection of Spring Fashions. Receive a Free T-Shirt 100% Cotton ($27.00 Value) Black or White XS thru XL or Cotton Shopping Tote with any purchase. My Secret Garden – 600 Saginaw St. – Gourmet treats, draw an egg for a discount or prize & wonderful displays and fashions! Painterly Pottery – 923 N Water St. – Come check out our Spring and Mother’s Day pottery! Panache Boutique – 214 Center Ave. – Stop by and get a fashionable head start on our amazing spring styles! Perfectly Imperfect Creations – 108 3rd St. Be entered to win giveaways with every ten dollars of purchases! 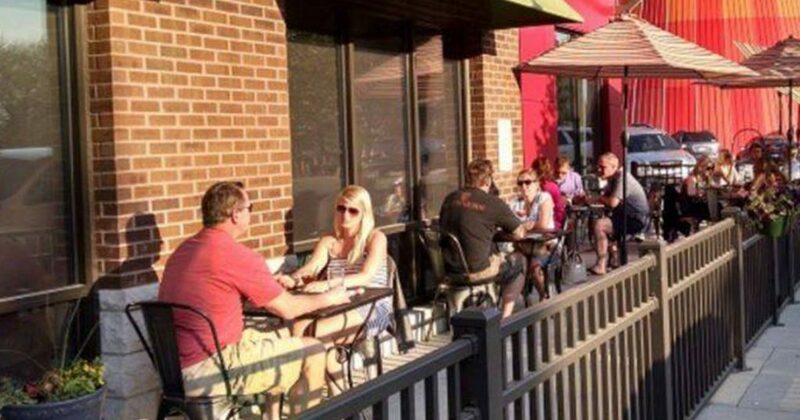 Populace Coffee – 810 Saginaw St. – Come try our seasonal Spring menu. Sempliner’s Bride & Formal – 902 N Water St. – Prom Sale! 50% off all in-stock remaining 2019 prom dresses. St. Laurent Brothers – 1101 N Water St. – Samples of St. Laurent Brothers handdipped chocolates and special prices on Easter candies. Studio 23/The Arts Center – 901 N Water St. Visit the newly renovated gallery and classrooms of Studio 23. Current exhibit is Delta College’s Arts & Letters Fest 2019! Art activities for all ages from Noon-4pm each day. Sweet Peach Children’s Boutique – 910 Washington Ave. – Join us for fun spring activities on Saturday, April 20 from noon-2PM. *Check out our Spring Fashions at City Market at 11AM. The Cat’s Meow Downtown – 810 Washington Ave. – 25% off storewide sale! The Gourmet Cupcake Shoppe – 915 Washington Ave – Stop by and try Free Samples of our amazing fresh baked cookies, cupcakes and more! Uptown Girl – 111 Center Ave. – Come check out great styles for Spring and Summer! Store wide savings! Village Chocolatier – 811 Saginaw St. – Gourmet chocolates and fresh chocolate dipped fruit. Violets Blue – 115 Fourth St. – It’s a planting, potting party! Pick out the plant, pick out the pot and we will do the rest. Bee Leaf Teas – Check out and sample our newest teas ready for your summer brewing. Modern Craft Wine – Come try our brand new release Northbound Spring at Bay City’s only wine tasting room! GCC Organics – Kids coloring contest, Product samples, Grab bag for discounts and free products. For the Love of Cheesecake – Stop by for a slice of your favorite cheesecakes or try some of our new flavors! 12:15pm – City Market Tour – Meet at the Community Teaching Kitchen inside City Market!